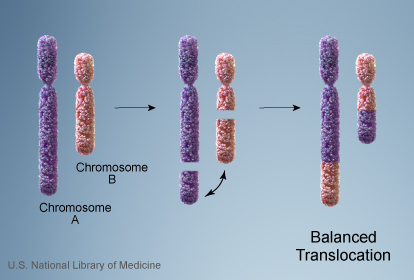 How can a chromosome translocation in somatic cells lead to abnormality or disease? In the Down syndrom typically, the translocation does not induce (usually; see later) any disease. We call someone carrying the translocation a "balanced carrier". The problem arises after, at the moment of segregation. Consider someone who has a translocation as you showed. You showed only one chromosome of each types (1N), below are the 2 chromosomes (2N). On the below image, the person with the translocation is assumed to be mating with someone who does not have the translocation. The balance carrier is usually healthy. 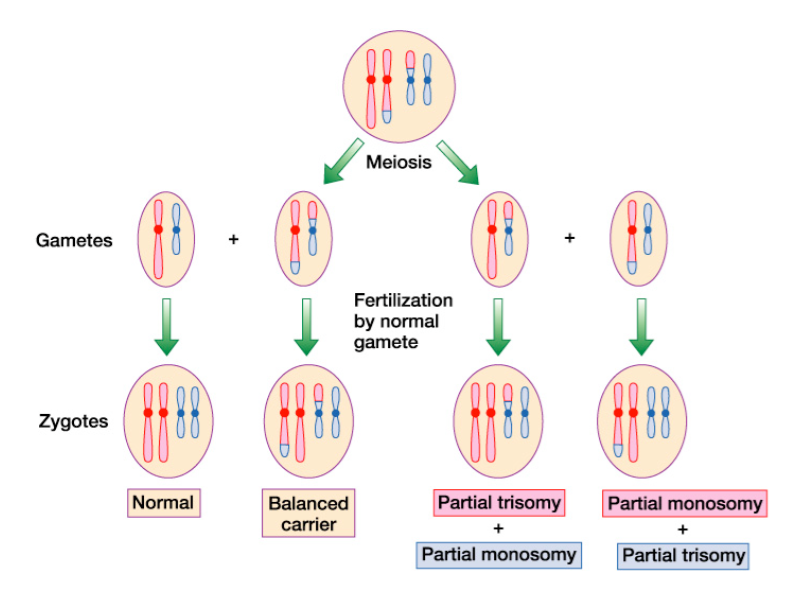 As a consequence of this translocation a kid has probability 1/4 to be "normal", 1/4 to have the translocation (and therefore to eventually have offspring with trisomy/monosomy) and a probability 1/2 to have trisomy/monosomy. Most balanced translocation carriers are healthy and do not have any symptoms. But about 6% of them have a range of symptoms that may include autism, intellectual disability, or congenital anomalies. A gene disrupted or disregulated at the breakpoint of the translocation carrier is likely the cause of these symptoms. Indeed, even a balanced carrier can be affected by the translocation. Gene regulation network is often quite complex and separating a gene from its regulatory region can eventually have important impact. It is also possible that the break point occurred in the middle of a gene (or a regulatory sequence). I think that one cannot say much more about why a balanced carrier can be sick in a general form. We'll need to go case by case and ask specifically what are the genes and regulatory processes involved in the disease. However, it is easy to conceptualize that moving genes around can affect the genetic network and the expression of genes. You have made an incorrect assumption-- that all the genes on both chromosomes necessarily remain intact. It's possible that they do, and the the translocation is harmless. But the transition point could be within a gene. This would usually lead to that copy of the gene becoming inactive, which can cause diseases just like any other loss-of-function mutation. Alternately, the translocation can fuse two genes in a pathogenic way. While this might seem fantastically unlikely, the fact that the translocations are non-random means that there are patterns that recur frequently. The BRC-ABL fusion (https://en.wikipedia.org/wiki/Philadelphia_chromosome) is one of the most common causes of childhood leukemia. The fusion protein is constitutively active because the regulatory domain of the original protein has been replaced. Finally, a translocation could separate a promoter element from the gene it controls, which could cause aberrant expression of that gene. The promoter element could also wind up proximal to a different gene and cause aberrant expression of that gene. Not the answer you're looking for? Browse other questions tagged human-biology genetics human-genetics cytogenetics or ask your own question. How does a tiger have stripes? What causes the range of severity of neurological deficits in Down's syndrome? Is it common to have multiple recessive traits in humans? Is it possible to have a random un-mutation of genes? Mechanism behind Philadelphia chromosome translocation?